Rob's older sister, Darcy, is getting married, and everyone in the household is caught up in the preparations. Wanting to stay out of the way, Rob climbs into the cherry tree between his house and the house of the lady next door, Mrs. Calloway. While there, he overhears Mrs. Calloway talking with a man, and the next thing he knows, she's been pushed out the window and sent to her death! Rob is absolutely sure of what he has seen, but when he reports the dead body to his family, everyone believes he is inventing the murder story to make things more interesting. The police then declare the death accidental. But the killer knows that Rob speaks the truth about what he has witnessed, and now Rob's life is in danger, too! 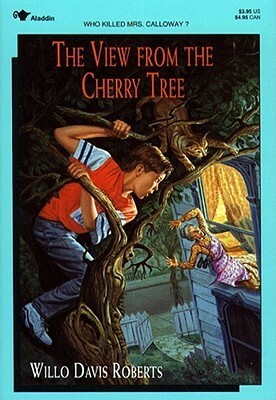 I am pretty sure I read this book as a kid, because the title and author have both stuck with me for a long time, but reading it this summer felt a lot like reading it for the first time. I think some of the memories I might have associated with this story are actually of another book by Willo Davis Roberts, Babysitting is a Dangerous Job, because there was almost nothing at all familiar about this book, even though I kept expecting to recognize something. At some point, I will need to read the other one to see if it sparks anymore memories. While I remember this as being a highly suspenseful book with a great twist at the end, it isn't really. For an adult reader who is familiar with the mystery genre, this story is actually fairly straightforward, and it isn't difficult to predict who the killer will turn out to be. Because the story is told in the third person, the reader never fully experiences Rob's fear as he is shot at and nearly poisoned. The situations that unfold once the killer starts trying to attack Rob are scary, but the reader is distanced from the main action because he watches it from the outside. I imagine the reason for this distance might be a desire to protect young readers from getting too upset by the story, but for me, it took away from the overall drama of the book. Willo Davis Roberts was a household name for my sister and me during the brief window of time when we both read middle grade books, and I'm pleased to see that many of her books are still in print and still available in my local libraries. That said, without any particular sense of nostalgia associated with it, this book fell flat for me, and I was a bit disappointed that I didn't have the feeling of satisfaction at the end that I so clearly remember from childhood.